Now with click.to, you can search for an address and phone number directly from a PDF, word document, an e-mail or anywhere else. 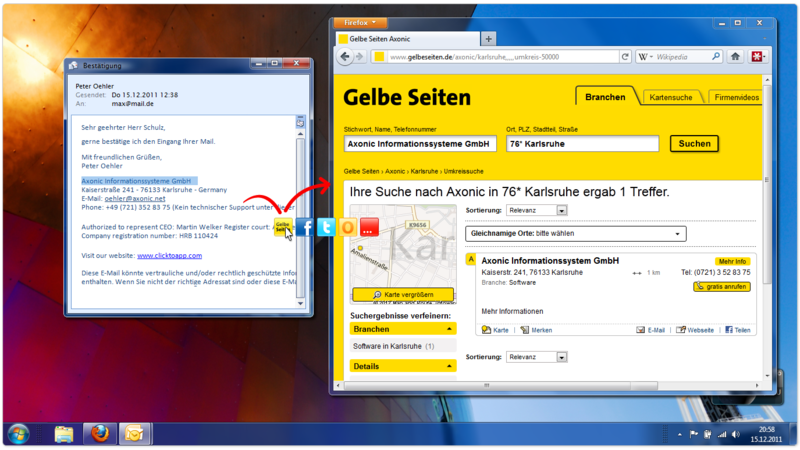 Gelbe Seiten and click.to also support complex searches, which means that you don’t need specifics to start your search! If you get an email asking you to look for a rental car in the center of Berlin, just highlight “rental car in the center of Berlin” from the email and click.to Gelbe Seiten! It’s that easy! Click.to knows what you’re looking for and will fill in the proper search fields to get the best result! With the great features of click.to combined with the vast amounts of data from Gelbe Seiten, you can now have all the information you need in the blink of an eye. Try it out for yourself and let us know what you think! I also would like to extend a hearty welcome to all the Gelbe Seiten users that are now part of the click.to community! 2 Responses to New Cooperation with Gelbe Seiten! !